» Zombies, Vampires and Dredd @ PAX! Zombies, Vampires and Dredd @ PAX! Where does the bloody time go? It’s been a whole year since we graced PAX Prime in Seattle and somehow 12 months has gone past and it’s time again for more PAX goodness – so WE’RE BACK! Buckle up Seattle because Ben and Miellyn are gonna be rocking the show this weekend showing off our latest titles, Judge Dredd: Countdown Sector 106 and Strange Loves: Vampire Boyfriends for iOS and Android. 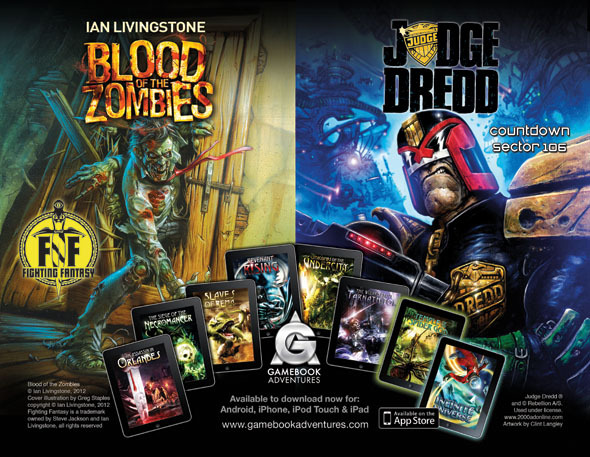 Not only that, but this is our first PAX as the official license holders for digital Fighting Fantasy gamebooks and we will be debuting the first iPad build of Blood of the Zombies as well as handing out some collectable goodies and FREE Gamebook Adventures titles! If you’re in town and attending PAX then make sure to look us up. Neither Ben or Miellyn bite so there’s no danger of zombie infections or vampirism. Is Blood of the Zombies being released today? No, not today. It will be available at the end of September. Sorry for the wait!